Save 43% when you buy Rick's European Easter book + DVD gift pack! 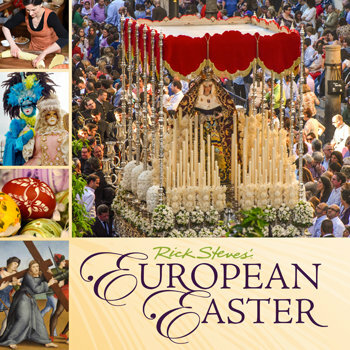 In this colorful companion book to the "Rick Steves' European Easter" TV special, Rick teams up with co-author Gene Openshaw to explore the intriguing mix of pagan, Christian, cultural, and edible traditions that led to the Easter festivities we enjoy today. Every region has its own way of observing the Easter season — ranging from religious to raucous, from fasting to feasting, from chocolate eggs to lamb-gut stew. These fascinating cultural differences make Easter a season of mystery, magic, and just plain fun. This book delves into the Biblical basis for the celebrations, richly illustrated through some of Europe's most iconic artwork, and digs down to the historical roots of the traditional celebrations still held today. Then it zigzags across Europe to follow all the celebrations that fill the early spring, from the parties of Carnival to the sobriety of Lent, from Holy Week processions to the joyous feasts on Easter Sunday. And a bonus last chapter gives a behind-the-scenes peek into the making of the TV special. With fascinating insights and vivid photos, this great gift book captures the spirit of the season. You'll learn something new — and old — about Easter.